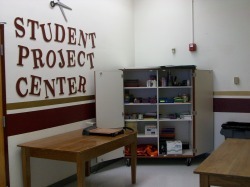 College Center is located along the back wall under the sports art. 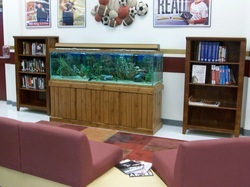 materials needed for classroom assignments. its place so others will have the same opportunity. 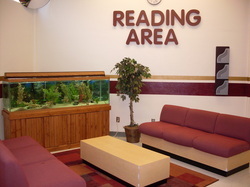 visit with friends, or just to read. themselves when using these areas. after school or with a pass during class. please let the librarians know. loan them to us if they are not being used. 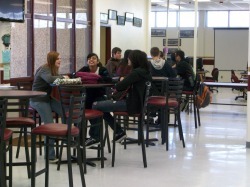 The Cafe area is very popular with students. We have big plans for it! occasionally as new furniture comes in. hot chocolate to students every morning! Come join us! 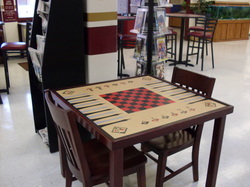 Students play chess while relaxing here in the library. We have 2 chess tables and chairs right now. 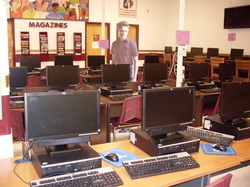 The 26 computers in the library are loaded with Microsoft Office 10.
saved in the "compatible" mode. and whether they are checked in or out. 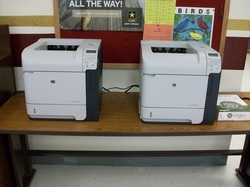 Students may print from computers in the library and there is no cost. 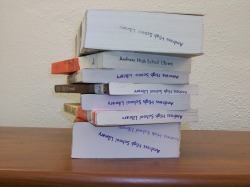 Printing is limited to school assignments and research.